As the Philippine government dithered and made excuses for its grossly inadequate response to the catastrophic floods � which inundated 80% of the country's capital, Manila � Sonny Melencio was leading a grassroots relief effort that brought the first food supplies in days to some of the poorest and most badly affected communities. Together with other activists from the Party of the Labouring Masses (PLM), Melencio went to urban poor communities along the flood-breached Marikina River with supplies collected from ordinary people, whose upsurge of solidarity was in sharp contrast with the official response. On August 13, Peter Boyle, a correspondent for Green Left Weekly and Links International Journal of Socialist Renewal, interviewed Melencio, the chairperson of the PLM. The party is part of a global network of people�s organisations and NGOs demanding imperialist countries pay up for the consequences in global warming and take radical actions to cut greenhouse gas emissions. Peter Boyle: With the heavy rains easing it is reported that the death toll is still rising, and some 300,000 people remain displaced and a new danger of disease epidemics is looming? 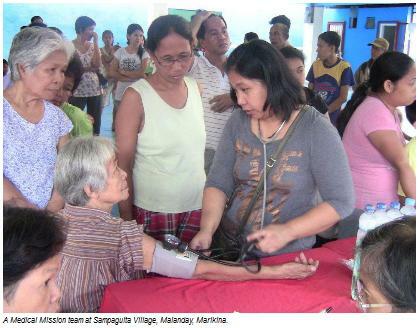 The disaster is far from over but how are the various strata in Philippines society coping and responding? Sonny Melencio: Tens of thousands of evacuees are returning to their homes and are facing a situation in which they won't even have a place to sleep on. Many houses have been damaged, others have been swept away by the flood, and most have mud inside their homes as thick as a foot high. They are forced to leave the evacuation centres, which are mostly public schools and buildings, as classes and government work resume today [August 13]. The poor have been the victims of the flood and will continue to suffer from loss of homes, loss of income (most are street vendors, tricycle drivers, itinerant workers and factory workers who did not earn for a full week during the floods), damaged health, rising prices and government neglect in all social aspects. There is going to be an extended period of crisis. After the floods, a health crisis is looming. The government�s department of health has issued a warning alert on expected rise of leptospirosis, typhoid and diarrhea due to the flood and contaminated water. The level of crisis is magnified by pharmaceutical companies jacking up the prices of medicines, especially for these illnesses. The price of anti-leptospirosis medicine for instance has been raised by 750%, prompting Philippines President Benigno Aquino to censure the drug company responsible (but not mention it by name), but stopping short of calling for price controls on vital medicines. On the other hand, I think the ruling class and the trapos [traditional politicians] are heaving a sigh of relief, not because the weather has improved and the floods have subsided, but because they are now free of the pressure to at least show some semblance of responsibility and concern to the flood victims. The media will stop showing shocking photos and video clips showing people�s deprivation in the streets and in the evacuation centres. It�s back to business for the elite. Peter Boyle: The mainstream media seemed to focus on blaming people who refused to leave their homes in the most flooded areas. What is this all about? Sonny Melencio: This has been the case every time there has been flooding, especially in Metro Manila. Of course, the usual flooded areas are the poor communities that are near rivers and canals in the cities. The TV reporters report on the dire situation, but one half of the report is spent on castigating people on why they did not leave their flooded homes. In the same breath, these reporters mention the lack of rescue boats and overflowing evacuation centres for residents in flooded areas. Those in the studio do the same thing; they join in the fray by prolonging the conversation on how "hard headed" and "foolish" the people are for not leaving their homes. This is the same spiel we heard from government officials interviewed on radio and TV. This has become the norm of mainstream media reporting during this calamity. I think they have been trained to report this way. It�s almost like they have a scripted report. Instead of investigating why there are not many rescue boats and what�s happening in the evacuation centres, the media would rather blame the victims for not heeding the government�s call for relocation. But this call for relocation is usually just a call. How can the government expect people to leave their homes when no means of transport are adequately provided; the evacuation centres are public buildings without adequate ventilation and toilets; and there is lack of food, water and other necessities that people need? In Barangay Olandes, Marikina which we visited on the second day of the flooding, more than a thousand residents in the evacuation centre and thousands more outside had not had food for a full day. Our porridge was just enough to feed those in the evacuation centre. In Lupang Arenda, Taytay, the 278 families in the evacuation centre were divided into 14 small classrooms with around 19 families per classroom. It was only on the third day that they were visited by local government officials who brought 14 cartons of cup noodles and sardines for everyone to share. Peter Boyle: The PLM has criticised the inadequacy of the official response, and like other people's organisations has stepped in to organise emergency aid with modest resources. There are also reports that attempts to replan Manila to avoid the worst flooding are being blocked by official corruption and indifference? What does this reflect structurally? Sonny Melencio: There have been billions of pesos slated for calamities every year. This year, it�s 10.5 billion pesos. The remaining calamity fund is around 6 billion pesos. But the release of the funds is open to corruption in the bureaucracy. The funds are ordered released by the president and it goes through the various departments and local government units concerned in cities or areas where a state of calamity has been declared. In the end, the bureaucracy decides where the funds will be used. It is easy for any official to divert the funds elsewhere. We have raised the demand that the calamity fund be used strategically, that is to allocate a big part to finance structural projects that will control flooding, such as building of dikes, water basins, barriers; modernising drainage systems; dredging clogged rivers and canals; and the like. Now, because of the flood crisis and the impending health crisis, we are demanding that the entire calamity fund be released to finance rehabilitation project for communities, and also to start strategic projects right away. Peter Boyle: At times of crisis like this we often witness an explosion of human solidarity from ordinary people. Have you seen this in this crisis? Can you give some examples? Sonny Melencio: The people are showing more solidarity with each other during the flooding. Neighbours help their neighbours; even children helped out by using styrofoam and plastic basins to roam around the neighbourhood and rescue residents who were trapped in their houses. You can see that in many photos. Many people�s organisations, NGOs, student groups and civic clubs came out from day one to support the flood victims. In fact, many braved the floods on the first few days, while the government took its time to distribute relief. The barangays (village councils) also became frontline organisations that undertook rescue and relief at the height of the flooding. Peter Boyle: Do you think it is possible to generalise this kind of solidarity as a basis for a new socialist society? What can help this and what are the barriers to such a generalisation of solidarity? Sonny Melencio: I think human solidarity is a basic trait of our people. Especially if it�s not mediated by people and institutions that want to profit at the expense of others, like the trapos who use the occasion to campaign for the coming elections. The president�s entourage, which boarded a truck that waded through the floods in Pasig City, consisted of senatorial candidates in the coming 2013 elections; shame on them. Or like the pharmaceutical companies and other capitalist corporations which raised the prices of their goods to astronomical figures because of big demand. Outside of these elite creatures and capitalist institutions, the ordinary people responded in the most humanely way. Most of the support we collected came from workers and urban poor residents too. They donated dry clothing, provided cooking utensils and helped out in the feeding stations we set up in the evacuation centres. People�s solidarity is a latent component that exists even in the capitalist system. We have to nurture it and provide an environment for it to fully develop by changing the system. Peter Boyle: Manila and other parts of the Philippines seem to experiencing these severe flooding every year. Is it getting worse? Do you think this is a symptom of global climate change? Do you think the imperialist countries that have a massively greater per capita carbon footprint have an obligation to pay for the terrible consequences of global warming and take a lead in addressing it? Sonny Melencio: The large amount of rainfall during typhoon or monsoon season that the Philippines is experiencing now is indicative of climate change. This has not happened before. We became aware of this phenomenon during Typhoon Ondoy in 2009, which inundated many parts of Metro Manila. What hit the Philippines this time was not even a typhoon, it was monsoon winds and rains, but the amount of rainfall has been reported greater than Ondoy�s. And this time around, half of Metro Manila was flooded, not to mention the nearby provinces surrounding Metro Manila in the north and south. 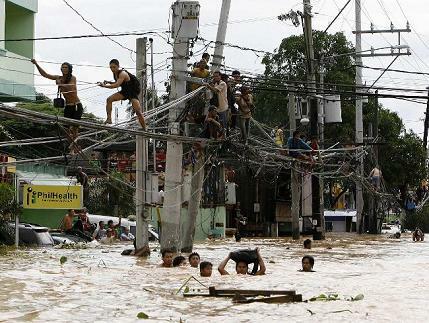 Massive flooding in Metro Manila is becoming a normal occurrence and it�s getting worse. There are already reports that the country would have to brace for another round of monsoon rains and winds. The PLM is part of the network of people�s organisations and NGOs that are demanding that the imperialist countries pay up for the consequences in global warming and to take radical actions to cut greenhouse gas emissions. We also believe that persuasion will not work with these imperialist governments, and what the peoples of the world should do is to apply more pressure against them. In the end, the only solution will be to get rid of the capitalist system and institute a system where human solidarity, human needs and the preservation of the planet�s resources would become a top priority. A health epidemic is now looming in the aftermath of the floods. Party of the Laboring Masses-PLM and its mass organisations are now preparing medical missions in the affected PLM base communities (see poster below). There has been no move on the government's part to do so in a comprehensive way. While we are calling on the government to mobilise all health professionals to affected areas, we are undertaking it on our own initiative as we can't wait for the government to respond. 1. For those with PayPal accounts you can send donations topartidolakasngmasa@gmail.com via PayPal and it will be sent directly to the Transform Asia flood appeal account. 2. Go to the Transform Asia website transform-asia.org/transform-asia-appeal and press the "donate" button. Listed below are the 10 latest comments of 62 posted about this article. Selective thinking is destroying the world.